Over the past 30 years, Soundown has built up extensive experience in reducing noise aboard sport fishing vessels. We’ve used that experience to develop this list of recommendations for dealing with the most common noise sources aboard sport fishing vessels of all sizes. While no two boats are the same, this list will get you on course towards a quieter vessel and a more enjoyable boating experience. The treatments below have proven effective on a wide range of sport fishing vessels. Each treatment description includes recommended materials as well as the path it will treat (airborne and/or structure borne) and the areas of the boat where it will be most effective. 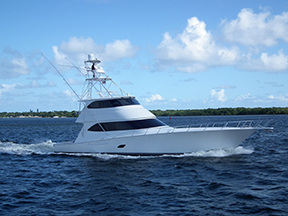 Problem: The layout of a sport fishing boat puts the accommodations close to the machinery. That means insulation of the machinery space is critical for reducing noise levels. QuietClad damped aluminum. We developed this system for larger sport fishing vessels where a hard finished surface is standard. 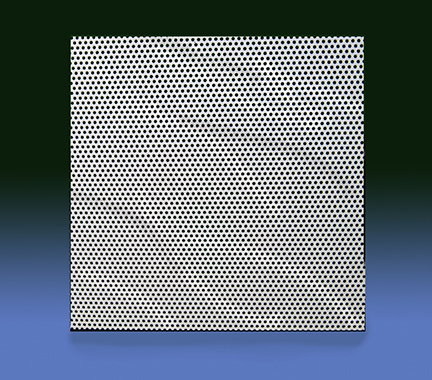 The QuietClad damped aluminum sheet provides both a clean white finish and excellent noise blocking properties, especially when used in conjunction with QuietStrips and acoustic fill. *Important note. In many sport fishing vessels the air intake trunks extend above deck, separated by ilnly a thin panel. This can create a flanking path – an alternate route noise takes around your treatments. We suggest that the back sides of such panels be insulated with the same material used in the machinery space. For vessels over 65’ or where a solid white finish is preferred please refer to our yachts under 100’ section for details. Problem: For sport fishing boats the most dominant noise on deck is typically from the exhaust. Even vessels equipped with basic mufflers experience significant levels of exhaust noise on deck, and the distinct tonal quality of exhaust noise is particularly bothersome to human ears. This is often magnified on expresses or convertibles with hardtops, because the height from the deck to the overhead is typically equivalent to ¼ wavelengths of the exhaust tones. At ¼ wave length a resonance will develop between the deck and overhead, reverberating and amplifying the noise. If a vessel has significant camber in the hardtop, you can often walk in and out of these “hot spots” where noise levels are the highest. Solutions: Soundown’s range of Waterdrop silencers are custom built for each installation and tuned to the specific frequency of your engine. With noise reduction as high as 25dBA, wind and water noise become the dominant sounds at cruising speed. At slower speeds, deck areas become more comfortable while trolling baits or cocktail cruising with friends. Problem: Structureborne noise radiates through the soles, producing noise and often vibrations you can feel in your legs. Treatments that go above the deck are particularly effective against these vibrations. Carpet underlayment , an alternative to standard carpet padding, provides plush foam padding that decouples a denser mass layer from the deck. The sole, carpet underlayment and carpet work together to create layers of sound absorption and blocking. Carpet Underlayment comes in a variety of thicknesses to accommodate your headroom requirements. While thickness constraints mean carpet underlayment is not a replacement for good engine room insulation, it can be a good upgrade to boats with well insulated engine rooms or a quick, easy first step for boats where engine room insulation isn’t enough.The ease of installation makes this treatment an easy upgrade for any vessel. Floating soles. For vessels seeking the highest level of noise reduction to produce extremely quiet interiors, floating the salon and /or lower deck soles is a must. In the detail below you can see how QuietStrips are used to isolate the QuietCore sole from the vessels structure. This effectively turns the floating sole into a shock-absorber for sound and vibration. Problem: Depending on the proximity of the cabin to the engines, good engine room insulation may not be enough. This culprit is typically the high level of structureborne vibration in the bulkhead which radiates into the cabin. 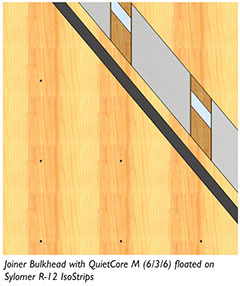 Solution: By floating the interior panel, we can break the path of that vibrational energy, reducing interior noise. Problem: The lightweight construction typical of sport fishing boats combined with the high horsepower of their engines means significant vibration is created while the engine does its job. Rubber Design flexible shaft couplings are another option to consider. These couplings isolate the specific excitation caused by gear mesh, which is carried down the shaftline and into the hull. This causes a distinctive, high-frequency whine on deck and in the salon. This high-frequency whine is also transmitted through the water, which many fisherman believe scares the fish.